RPMC was given quite a compliment on Saturday at the 7th Congressional District Caucus! 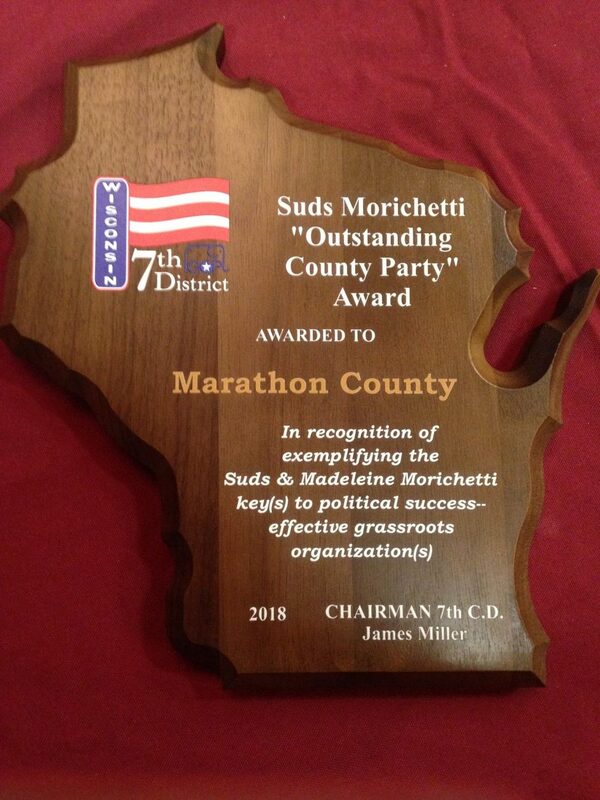 Out of the 26 counties that comprise the 7th Congressional District, we were awarded the 2018 Suds Morichetti “Outstanding County Party” Award. The Award is presented “in recognition of exemplifying the Suds and Madeleine Morichetti key to political success – effective grassroots organization. “Marathon County continually exemplifies what it means to have a grassroots effort in everything we do! Our members bring all of their talents together to reach our end-goal. We are so very fortunate to have such dedicated individuals that volunteer in ways only other county parties dream about. Thank you from the bottom of our hearts.” Together we can reach greatness in Keeping America Great! Thank You!